ALLENHURST & LOCH ARBOUR – At first glance, you may not think of Mel Stultz as a gentleman. Big scruffy beard, covered in tattoos, a bit rough around the edges to say the least. But that doesn’t mean the man can’t clean up. Especially when it comes to appeasing the local creative masses with his wild and epic events.Mel was the force behind the early Asbury Lanes and has been putting on events around these parts for years. His first car show in Asbury was called the Jalopy Jump n’ Jive and was a well attended show featuring all types of pre 1965 hot rods and motorcycles and as always great live music. The next trick up Mel’s sleeve is amongst his biggest acts yet. He didn’t want to do just another ordinary car show. Mel wanted something with action. 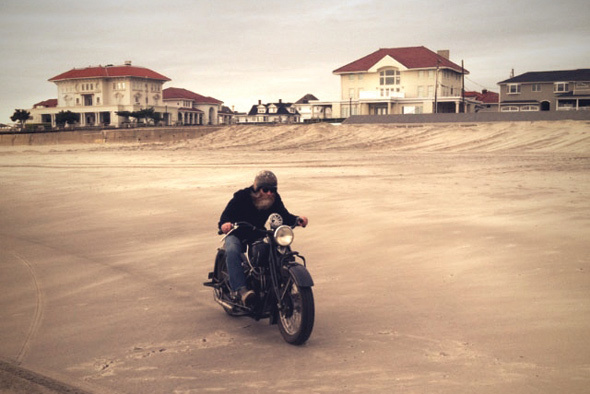 We’re talking about The Race of Gentlemen which takes place on Saturday, October 20th with a beach party and bonfire the night before (Friday, October 19th from 8pm to 12am) at the Allenhurst beach just north of Loch Arbour at Ocean and Allen Ave’s. The Race of Gentlemen will feature 1/8 mile drag races on the beach from jetty to jetty with only pre & post war cars, hop ups and tank shift motorcycles. Mel got the idea for the event one day when he was hanging at the beach with a buddy from his vintage car club The Oilers. The two were talking about the beach races of days gone by, the ones that made car and bike racing popular back in the late 19th and early 20th century’s. As cars became more and more powerful, beach racing was swallowed up by the tide as race enthusiasts graduated to street tracks. So Mel decided to try and recapture that glory here in Coastal Monmouth County. In a chance meeting at Max Fish at the Beach in Asbury, Mel ran into Allenhurst mayor Dave McLaughlin and presented him with the idea. The mayor loved it and the two sprinted forward to make it a reality. Now, one thing you should know about Mel is that the man appreciates the past and does his best to pay homage to it at every turn. Whether it be an interior space he’s designing or a hot rod he’s breathing new life back into, its Mel’s attention for detail and his desire to stay true to the ghosts of history that make him the crazy, wild-eyed creative person he is. It’s all about authenticity with him. “I sleep and breathe the way it used to be done, ” Mel tells us over the phone. Which is exactly what The Race of Gentlemen is all about. Make no mistake about it. This is the real deal on every level. The racing starts at 10am Saturday morning. So far bikes and cars will be showing up from all over the East Coast. Lots of early Indian’s and Harley’s ranging from 1911 to 1947. Cars are ranging from the late 20’s thru 1934. A bike and car show will also coincide with the racing. Anyone with cool pre 1960 cars and bikes are welcome. Those will park up along Ocean Avenue and in the Loch Arbour beach parking lot. Friday night features the band The Swinging Neck Breakers at the free beach party. There will also be a big top tent, Woody cars and vintage single fin surfboards on display as well. People are encouraged to pack a picnic and blanket on race day. Mel is also hand making everything for the event. Hand painted signage, giant checkered towers at the start and finish lines, and other hand fabricated props. When the sand finally settles at the end of it all, The Race of Gentlemen will present an award ceremony featuring pretty ladies, handshakes by mayor Dave McLaughlin of Allenhurst and Rob Fernicola of Loch Arbour and the presentation of flower wreaths. The idea is for this most epic of beach days to return next year. Bigger, badder and better. If Mel Stultz has a hand in the mix, you can bet on that. To get in touch with Mel email him at theraceofgentlemen@yahoo.com. This entry was posted on Wednesday, October 17th, 2012 at 11:34 pm. It is filed under FEATURE. You can follow any responses to this entry through the RSS 2.0 feed. Sometimes chapel is the basic acupuncture for insomnia price which is having a cremation, as well. people will provide a responsible staff to assist you through the visitation, no amount of stress or grief.